The row of terraced houses shown in the picture was situated about five feet lower than the road on the left and were known as the 'Diggings'. It may have been that the original road on which the 'Diggings' was built may have been bypassed by the A638, which was lifted in height during construction. The Railway Hotel was owned by Warwick and Company's Anchor Brewery of Boroughbridge and was originally known as the "Old Half Way House" back in the 1830s. Warwick's Ales and Stout were very uncommon in the local area and only the Elephant & Castle in Westgate, Wakefield is known to have been owned by the same company. The Railway Hotel was auctioned at the Cooper’s Arms in 1882, but withdrawn since only £950 was bid. In the 1960s, the Railway Hotel had to be shored up with wooden buttresses after severe subsidence, probably as a result of ancient coal mine workings, almost caused the building to collapse. Harvey 'Cuddy' Cudworth, Bill Mackie, Minnie Tomlinson and Irvin Littlewood were some of the colourful characters who were landlords at the Railway. Some of the Railway Hotel's best customers and pub regulars were Horace and Joan Dews, Jim Bulmer and his son Tony, Jeff Hey, Ron Wilby and Jeff Pickersgill. "OSSETT INN WALLS CRACK AND SAG"
"Travellers on the Wakefield - Dewsbury Road in recent months have been surprised to see a well-known hostelry, the Railway Hotel at Flushdyke, apparently having to be propped up by stout wooden beams. Those who have gone inside for "a quick one" have seen even more astonishing sights. The erection of the beams was necessitated shortly after the severe weather last winter, when subsidence of the land caused a huge crack in the front wall of the house, the length of all three storeys, and extensive damage. The cracks in the walls of the kitchen resemble a jig-saw puzzle and plaster has fallen off the ceiling showing the laths. The inside wall between the kitchen and the tap-room, two feet thick, is out of perpendicular and cracked in many places. None of the doors fit properly and customers sometimes have a struggle to get in and out of the main entrance. 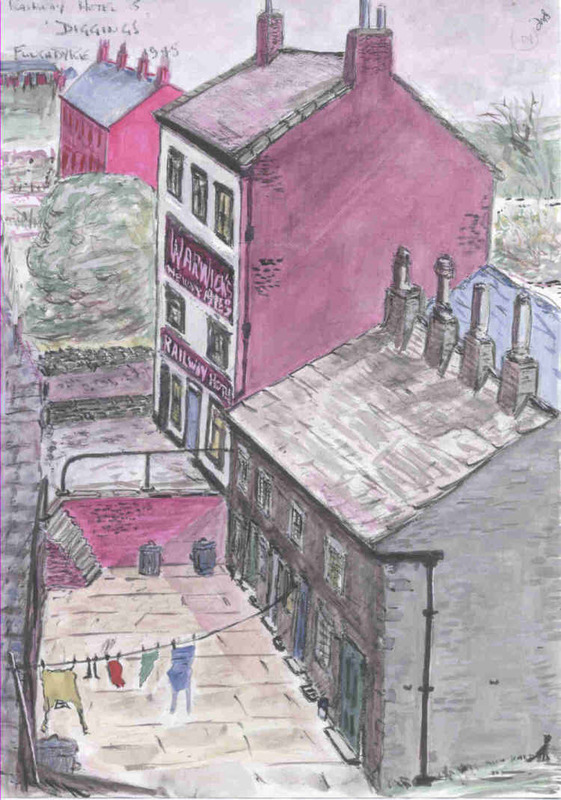 The recess at the end of the bar, situated in the corner of the building, is so badly damaged that its use as a jug and bottle department has had to be abandoned; it is impossible to open the door which gives access to the street. Also out of use is the sitting room on the first floor, situated over the tap-room. Some of the cracks between the windows and walls are three or four inches wide and daylight can be seen through them. The walls of the staircase are also badly cracked and one side is being held together by a huge nail. Mr. H. Cudworth, who has been licensee of the hotel for 23 years and is over 80 years of age told an 'Ossett Observer' reporter that worrying over these occurrences had made him ill. He wanted to relinquish the business and go into a private house, but despite every effort by his family to find a buyer they had been unable to find one." 'Cuddy' Cudworth did sell the business though and in 1949, Edwin Tomlinson became the licensee and the Railway Hotel struggled on in its rather dilapidated state until June 1962, when licensee Irvin Littlewood finally threw in the towel. The pub closed and was demolished shortly afterwards.